2012-13 was the second year that the “Regional Grand Lodge of South India Charitable Trust” came forward to support the Scholarship program at VRS center. We were delighted when the Trustees agreed to come to school and give away the scholarships to the children. It was the last Deepam session on April 13th, and the Year-end assessment had started early for the Basic, Intermediate and Advanced groups. 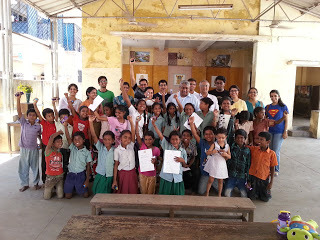 With the children busy with assessment and out of the way, few volunteers arranged the Certificates and covers in order, and got the stage set for the chief guests. When they – Mr.Rajan Sekri, Mrs.Sekri and Mr. Sivakumar – arrived, there was a quick round of introductions, and everyone assembled for the event. The school teachers were seated on a bench and the parents of the 6 scholarship recipients on another. Volunteers preferred to stand at the back, each with a cell phone camera ready to click away. After welcoming the guests and highlighting the activities of the Trust, Abhishek Mundhra requested Mr Sekri to address the gathering. The next 15 minutes were delightful with Mr Rajan Sekri packing words of advise and encouragement, in a jovial and spirited talk that was interrupted many a time by loud claps..He endeared himself to the kids and volunteers alike with his spontaneous wit. Following this, the six recipients of this year’s scholarship (Jenith, Uma, Keerthana, Vaishali, Poongavanam and Shranya) were called out to receive the certificate from the Principal and the scholarship of Rs.3000 from Mrs.Sekri. Four other deserving children (Nitish, Dhinisha, Akhila and Swetha) were given a reward of Rs.1000 each in recognition of their consistent efforts. The guests had brought chocolates for the children which were also distributed . Meantime, another well wisher of Deepam, Ms.Amritha who had earlier donated a huge haul of stationery and colours, was called upon to give away crayons to all the children, delighting them further. Then, Uma and Jenith, both scholarship recipients, spoke a few lines about Deepam and how much they liked the weekend classes. The parents were visibly moved by the gesture, and thanked us profusely. It was time for the group photographs and more smiles. The chief guests left soon after, having graced a simple but significant occasion for the kids and volunteers of Deepam VRS. We know deep down that the scholarship kids will continue to do well in the higher classes and will recall this day with pride.